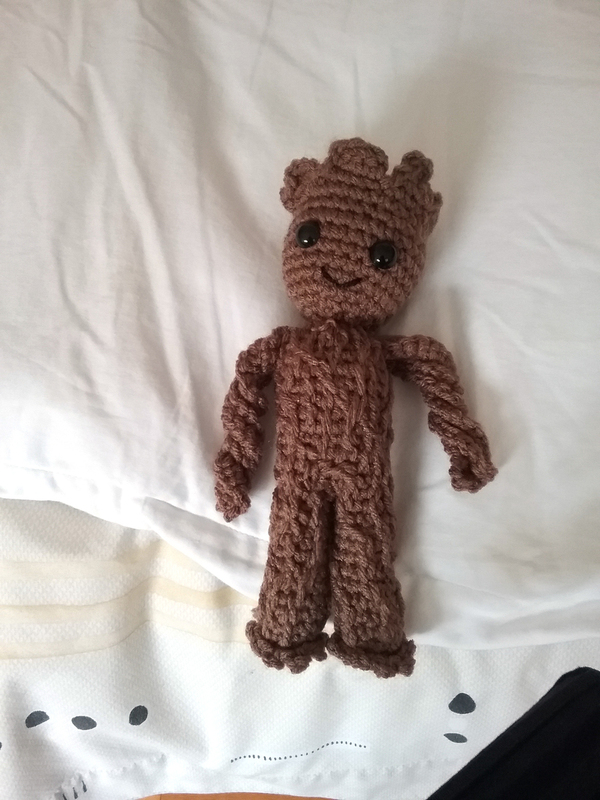 I was going to post my groot and realized there is another one here. I made this one from a book/kit that I bought from COSTCO with patterns for MARVEL characters, but I adapted the proportions to make it more baby-ish. The original one is for big groot. Haven't figured out how to put the leaves. The texture in the body that I added too is made with embroidery. I don't know how the stitch is called, chain stitch? As with all amigurumis I have made, the little details are the most time consuming. Very cool. I will have to look for that kit in my Costco. Not all of them carry crochet or knitting stuff. Very cute. The smile is the perfect touch. They also sell the kit in Amazon. They don't carry it all the time i Costco. I have seen it several times but not during the whole year. I think they carry it during the fall.